This title seemed appropriate for a first post in 2016. I hope it is going to be a good and productive year with fewer eye problems than last year. My specialist reminds me that I still have sight and anything else is really secondary! These flowers are an Australian native commonly called Kangaroo Paws - from the species Anigozanthos. I think the more common one is red colored but these plants were given to me and they have grown with very little care. All the honey-eaters (birds that feed on nectar) like them and often the birds are so much bigger than the flowers that the stems are bent right over to the ground. This flower head was growing under a palm leaf and I think that is why it has grown in this rather different shape. What could be more Australian than a Kookaburra? I always like the patterns of light and shade on the birds perching on the tree branches. This one eventually flopped down on the grass. 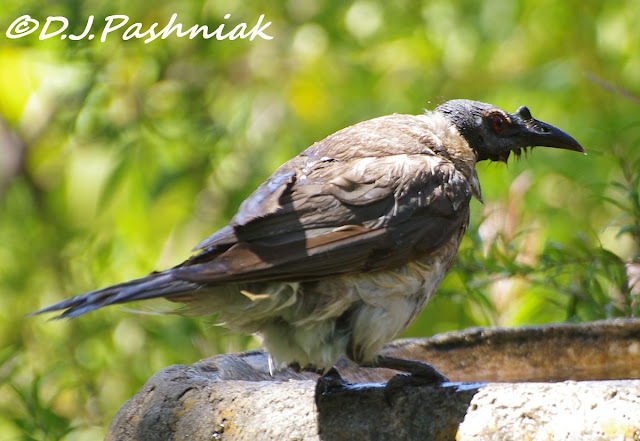 My friend did not look too happy to see this bird and when I asked why she said that they were sitting out on the front veranda and enjoying afternoon tea the previous day. There was a bit of squawking in the tree top then the Kookaburra came down onto the lawn with a tiny naked bird in its beak and proceeded to eat it in front of them.! 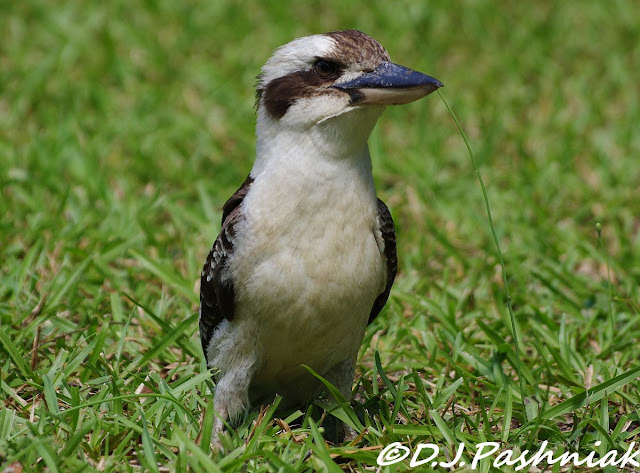 Kookaburras seem to enjoy eating just about anything that moves! This bird is a Noisy Fiarbird (Philemon corniculatus) and wouldn't really be thought of as an Aussie Icon! 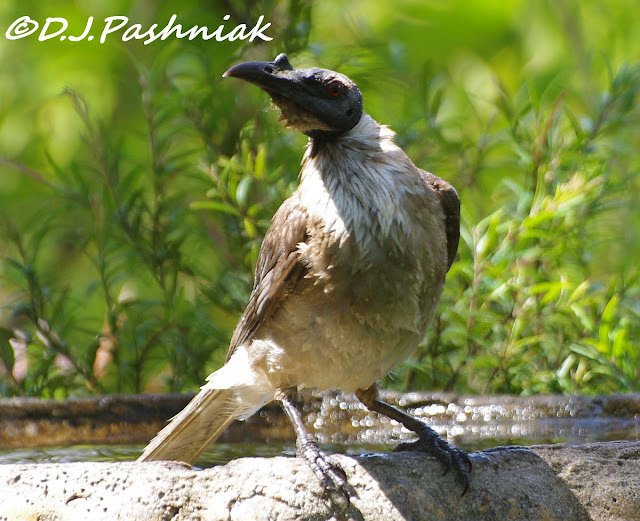 However, these birds are associated for me with hot summer family beach camping holidays. I had grown up in New Zealand and these were not birds I had ever seen or heard before. I can't think of anything nicer than those long ago camping holidays - in among sand hills just back from the beach and under small trees which grew in that kind of habitat. Back then we called them "Leatherheads". This bird had just been cooling off in a bird bath. I have now brought my red Kangaroo Paws plant in to my unheated conservatory hoping it survives the Winter. Very nice post! 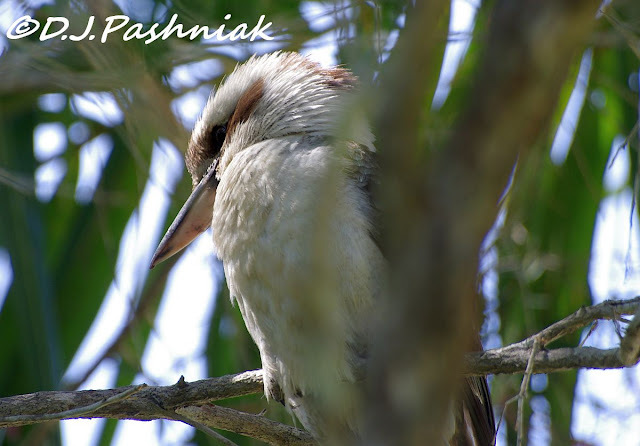 I saw my first ever kookaburra on my first day in Australia - I took as some form of possitivesign! And I think I may have been correct! Great post to begin the New Year, Mick! That interesting plant is a beauty! The "leatherhead" is a species I'd never heard about. I really like your memory of camping near the beach as I have very similar memories. Here's wishing you all the best and keeping our fingers crossed for no more eye worries this year! What a wonderful post Mick! I love all things Australiana. The Kangaroo Paws are so unique, great kookoo bird shots (that's what my granddaughter called them when she was little). Hope 2016 brings you happiness and good health! What a great name for a plant and so appropriate. Ah, yes!! 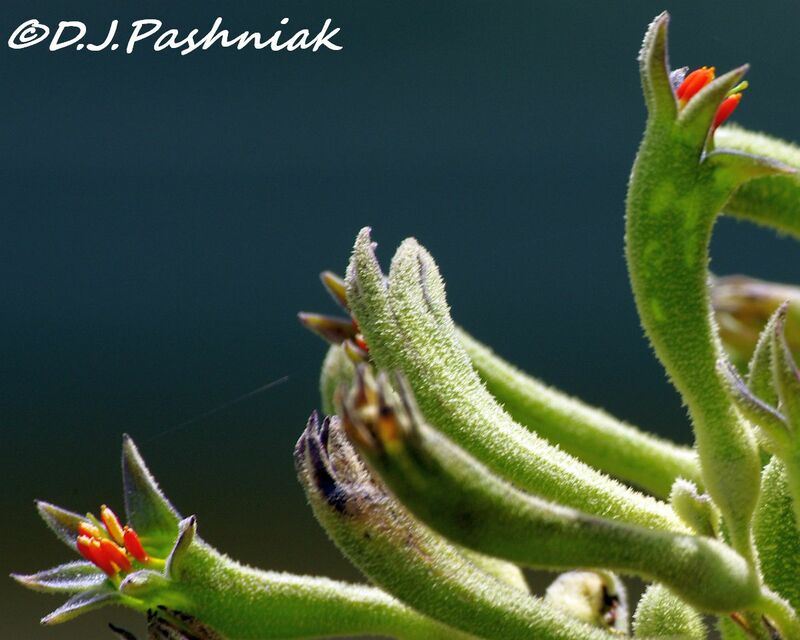 I love the Kangaroo Paws, too!! Beautiful captures of them and the birds, too!! A wonderful post for the day, as always, Mick!! Wishing you a great new year and my fingers are crossed, too, for no more eye problems!! The Leatherhead does appear to be an unusual looking bird- quite primitive even? 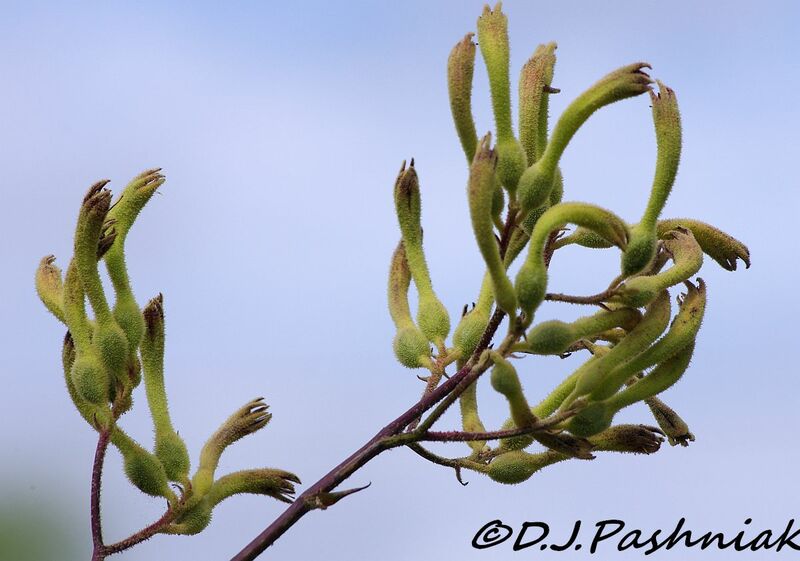 Kangaroo Paws was a well chosen name. I can see why from your photo. I hope you have a good year and that your eye health improves even more. All the best for 2016. Hello, the plant is pretty. I love the Kookaburra and the Fiarbird is cool. I wish you all the best in 2016, a happy healthy New Year! Didn't know about the kookaburras eating habits .. Oops, no matter how much one believes in the balance of nature and all, that sight would definitely spoil your afternoon tea! Yikes. Love the plant name ... Definitely Australiana... Wishing you good health, eye and everything else and a joyous 2016. 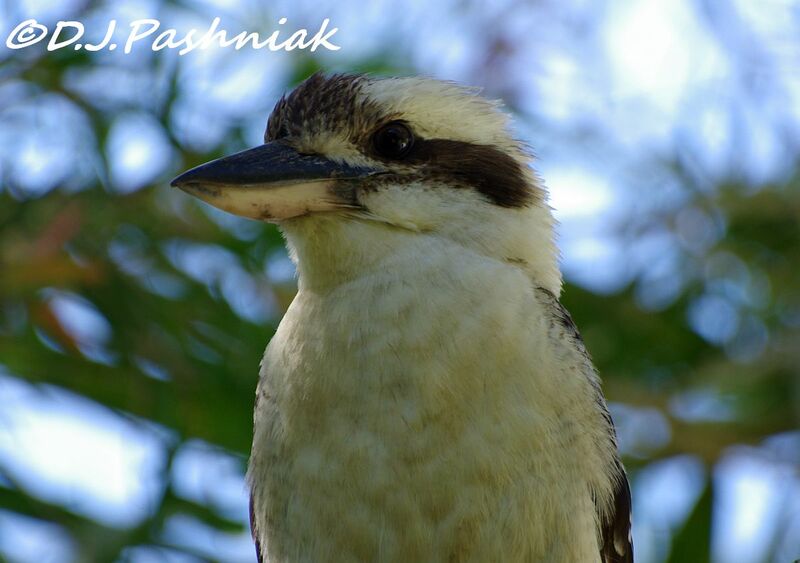 The Kookaburra is a handsome bird. It reminds me of singing the Kookaburra song as a child in girl scouts. I never knew what it looked like, now I do. Love both the plants and birds from. Australia. Happy New Year. I am home now from my trip to Malawi but thanks for leaving me all the comments when I was away. The Leatherhead reminds me of Mole in "The Wind in the Willows". It's rather cute in an odd sort of way. I wonder if we could grow kangaroo paws in California. Something for me to check out. 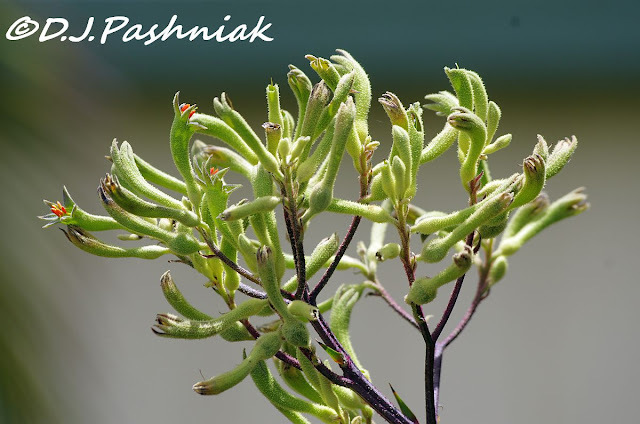 Kangaroo Paws, Kookaburras and those Leatherheads! You live in such a fascinating world! The Friarbirds are never going to win any beauty contests are they? But still a good bird to watch.